Ideal location, good value, great free breakfast. Perfect for solo travellers, young couples or backpackers. Very accessible from either Blanche or Abbesses metro stops. 5-7 minute walk from these stations. Nice and clean bedrooms, with a newly fitted bathroom. Bunk beds were rather noisy when there was movement but mattress was very comfortable and I slept well. Surrounded by fresh fruit stores and nice restaurants. Good area! Close walking distance to the Sacré-Cœur, well worth the walk up. Free breakfast was a great way to start the day! Would stay here again. Room tip: Make sure you make the most of the free breakfast. The price you found is 18% lower than this hotel's average rate of $266/night. The price you found is 14% lower than this hotel's average rate of $201/night. Fantastic hostel in a great location. clean towels and sheets. Free wifi in all rooms and free breakfast. We wish we could have stayed an extra night. Would highly recommend. The front desk clerks are friendly and helpful. The locale is good with quite access to several metros. Rooms are cramped and in dire need of repair. The showers have plenty of hot water. Be careful, though. Shower stalls are so small that it is easy to bump into the knobs and thus get a scalding hot shot of water or a dash of ice cold. Our room had an awful sewage odor that we reported to no avail. 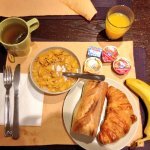 Breakfast is included, but it is not much (croissant and bread, coffee, juice, and cereal). My advice is too look elsewhere. For the price you can do better. Room tip: Avoid street side rooms as they are noisy. 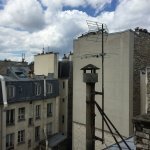 Close to 2 train stations (Abssess and Blanche), walking distance to Moulin Rouge, AND Starbucks. Great breakfast in the morning, well, compared to most hostels, friendly staff. Cleaning lady is a bit rude. We stayed overnight here en route to Nice for Euro 2016 and were very impressed. The hostel had a super friendly relaxed atmosphere and the facilities were excellent. 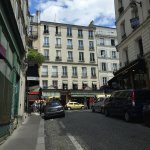 The surrounding Ning streets were vibrant and eclectic and all in all I would recommend this as a great place to stay whilst visiting Paris. Thank you for your kind review, we are happy you liked the atmosphere and the neighborhood. The hostel rooms were pretty standard, not sure what was "boutique" about it and in terms of space and amenities I would have preferred to stay in another hostel in the area but unfortunately that one was full. However, the welcome we received here was great and very helpful. The private room was also very nice - small (like all hotel rooms in Paris!) but perfectly formed. Bathroom was clean. I would definitely stay in a private room here again as I think they are very good value. Location is wonderful. Would also stay again in a dorm room though don't expect anything particularly special.